Is Ukraine a Proxy Western-Russia War? 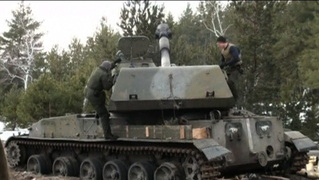 U.S. Weighs Arming Kiev as Violence Soars | Democracy Now! professor emeritus of Russian studies and politics at New York University and Princeton University. His most recent book, Soviet Fates and Lost Alternatives: From Stalinism to the New Cold War, is out in paperback. His recent writings on the Ukrainian crisis are on TheNation.com. AMY GOODMAN: Last week, former Soviet leader Mikhail Gorbachev accused the West of dragging Russia into a new Cold War. He said, quote, “If we call a spade a spade, America has pulled us into a new Cold War, trying to openly implement its general idea of triumphalism. Where will it take us all? The Cold War is already on. What’s next? Unfortunately, I cannot say firmly that the Cold War will not lead to the hot one. I’m afraid that they might take the risk,” he said. STEPHEN COHEN: Well, it was never honored in full. And the primary problem was—I mean, there were many provisions of the ceasefire, which was supposed to stop the fighting in the east and lead to direct negotiations between the rebel government, or fighters—we call them “separatists.” They weren’t separatists when all this began, but now they’re separatists: They don’t want to live with Kiev any longer. But it was supposed to lead to negotiations. The main thing that happened was, is it required both sides to pull back their artillery, primarily Kiev, because Kiev was bombarding the capital cities of eastern Ukraine—Luhansk and Donetsk. That artillery was never pulled back. It was supposed to be 30 kilometers. How far back they pulled them, I don’t know. But as you know, in the last week, those cities have been bombarded again. So the ceasefire was honored kind of marginally in the breach for a couple months, but about a week ago, 10 days ago, the fighting escalated. STEPHEN COHEN: Well, he’s much more than that. People need to drop their masks and say what their personal stake in this is. Strobe Talbott, whom I’ve known for years, was the architect of the American policy that led to this crisis. He was “the Russia hand,” as he called his memoir, under President Clinton, when the expansion of NATO toward Russia began. Understand what he said—and the rollout of this report has been coming. And if you look at the signatures, these are the leaders of the American war party, the people who literally want a military showdown with Russia. Stop and think what that means. Stop and think what that means, as though Russia is going to back off. But the people who signed this report—and they’ve been bringing it out for days—are saying that the—he literally just said this—the future of the 21st century is at stake in Ukraine. Stop and think what that means. Then he went on to say things that are fundamentally untrue, that Russia has invaded and annexed eastern Ukraine. I mean, when the State Department was asked a few weeks ago, “Can you confirm the presence of Russian troops in eastern Ukraine?” the State Department, which misleads about this story all the time, said, “No, we cannot.” So what are—this is what I’m talking about the fog of war, where we’re being told Russia has annexed eastern Ukraine, the stake of the world is at—the future of the world is at stake here, and basically they’re calling for war with Russia. AMY GOODMAN: Our guest is professor emeritus of Russian studies and politics at New York University and Princeton University, Stephen Cohen. His latest book, Soviet Fates and Lost Alternatives: From Stalinism to the New Cold War. Aaron? STEPHEN COHEN: That’s my short point. But let me ask you a question. Five million people, approximately, live in this area of eastern Ukraine. They’ve lived there for centuries. Their grandfathers, their parents are buried there. Their children go to school there. That is their home. Do they have no humanity or agency? We’ve taken—not I, but the main press in this country is referring to them as “Putin’s thugs.” Where is the humanity of these people who are dying, now nearly 6,000 of them? A million have been turned into refugees. These are people there. Who’s doing the fighting? Primarily, the folks, the adults, of these people. Have they had Russian assistance? Absolutely. Has Kiev had Western assistance? Billions of dollars. General Hodges—I don’t know exactly what he does, but he’s an American NATO officer—publicly announces he’s in Ukraine to train the National Guard. Both sides are involved militarily. But make no mistake: If there was not an indigenous rebellion in eastern Ukraine, there would not be a Ukrainian civil war. Is Putin abetting the east? Yes. Are we abetting the west and Kiev? Yes. STEPHEN COHEN: What? His presence in Latvia? Well, he’s in Ukraine now. What it means is we’re on the move militarily—”we,” I mean NATO, but the United States runs NATO. You heard what Strobe Talbott said: We’ve got to do everything now to defend Ukraine. By the way, he doesn’t mention there are two Ukraines. What about the people in the east I just mentioned? Have they no humanity? But we are on the verge of war with Russia. So, is this good or bad? Do we go to war? Did we have a debate before we invaded Iraq? We did. And those of us who opposed it lost the debate. But we had a debate. That “democracy now,” not today, not in the United States. There is no debate whatsoever. So, the danger is great. There is no opposition. All these people you’re showing—Strobe Talbott, General Hodges, anybody else you put on the screen, because only they speak to the American people—they’re on the march. STEPHEN COHEN: All of the above, I think. I don’t know. I’m not smart enough to tell you. Historians will look back—assuming there are historians to look back, because both sides are now mobilizing their nuclear weapons, as well. Russia has already said that if it is faced with overwhelming force on its borders, it will use tactical nuclear weapons. They’re nuclear small, but they’re nuclear weapons. When is the last time you heard a great power say that? We say—Obama, our president, says, “We’re modernizing our nuclear weapons.” What does that mean? We’re redeploying them, pointing them even more at Russia. Why is this happening in the United States? I don’t know. I think there’s a lot of factors mixed in, a kind of ideological hangover from the old Cold War. But the demonization of Putin has become so extreme in this country, I do not recall—and I entered this field back in the '60s—the United States ever demonizing a Soviet communist leader the way our leaders do—Obama, Mrs. Clinton referring to him as a Hitler. Look, if Putin is Hitler, clearly we have to go to war. That's the logic, is it not? Is it not? And where are the voices that say this is crazy? He may be a Russian nationalist. He may be threatening. But Hitler? SERGEY LAVROV: [translated] I have two comments which are important. There has been confirmation that the United States was directly involved, from the very beginning, in this anti-government coup d’état. And President Obama literally called it “the transition of power.” Secondly, I would like to note that Obama’s rhetoric shows Washington’s intention to continue doing everything possible to unconditionally support Ukraine’s authorities, who have apparently taken a course toward a military solution to the conflict. Here’s what happened. And he’s right about Crimea. He just let the cat out of the bag here. An agreement was brokered in February. Everybody think back. It’s only one year ago. Foreign ministers of Europe, as violence raged in the streets of Kiev, rushed to Kiev and brokered a deal between the sitting president and the opposition leaders—Yanukovych—that he would form a coalition government and call new elections in December. And everybody thought, “Wow, violence averted. We’re back on a democratic track.” And what happened? The next day, mobs took to the streets, stormed the presidential palace; Yanukovych, the president, fled to Russia. But we now know that when that deal was struck by the European ministers, Putin and Obama spoke on the phone, and Putin said to Obama, “Are you behind this?” And Obama says, “I am. Let’s get back on peaceful track.” And then he asks Putin, “Are you behind it?” And Putin said, “A hundred percent.” And the next day, this happened. So, something happened overnight. Obama lost control of the situation. He didn’t know what was going on. But when he says that they negotiated a peaceful transition to power, he’s not referring to the overthrow of Yanukovych; he’s referring to the deal he signed onto to keep the Ukrainian president in office for another eight or nine months until national elections. AARON MATÉ: Can you sketch out for us the fighting that has taken place since April? The U.N. now says the death toll is over 5,300. Samantha Power, the U.S. ambassador to the U.N., has praised Kiev’s response and said that they practiced “remarkable, almost unimaginable, restraint” in their attacks on the separatists. AMY GOODMAN: Well, Professor Stephen Cohen, we will continue to cover this. We thank you very much for being with us, professor emeritus of Russian studies and politics at New York University and Princeton University. His most recent book, Soviet Fates and Lost Alternatives: From Stalinism to the New Cold War, is out in paperback. And we’ll link to your recent writings on Ukraine at TheNation.com. This is Democracy Now!, democracynow.org, The War and Peace Report. When we come back, Professor Vijay Prashad on the Middle East, what’s happening, from Libya to Saudi Arabia. Stay with us.